First 12 episodes of the third season aired on simulcast basis from last April to July. 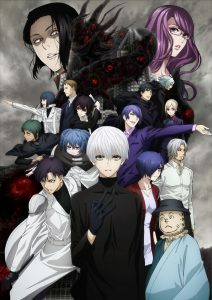 Southeast Asian anime channel ANIPLUS Asia has announced in August that they will air the second part of Tokyo Ghoul:re will premiere next month. The anime channel revealed on Tuesday the continuation of the popular action-horror series will premiere on October 9, airing Every Tuesday nights at 11:00pm (10:00pm JKT/BKK), within an hour after the initial Japanese telecast. Tokyo Ghoul:re is the third season of the popular Tokyo Ghoul anime series, which is based on the second spin-off manga of the popular series by Sui Ishida. The manga as serialized in Shueisha’s Weekly Young Jump magazine from October 2014 until Last July, which has a total of 16 volumes. The staff from the first part, including director Odahiro Watanabe, scriptwriter Chuji Mikasano, and character designer Atsuko Nakajima, returns to work on the upcoming episodes, which will be produced by Pierrot. Natsumi Hanae (“Eiichi Misumi”, Gamers!) returns to portray the lead character “Ken Kaneki”. The second part of Tokyo Ghoul:re will be the continuation of the first part, which was also aired on the channel in a simulcast basis from April to July of this year. The previous two seasons of Tokyo Ghoul are streaming online on video streaming service Netflix in the Philippines.